Hollybeary Creations : Bacon Love!! Hi everyone.. Thanks for popping in today. I have a fun card featuring the Alley Way Stamps sets Big Time and Bacon Bits. I created a honey comb background on a White card base using some Tumbled Glass Distress Ink and the Honeycomb stencil from Tim Holtz. Then I stamped the " Love" sentiment from Big Time and the other images from Bacon Bits onto some White Card stock and colored them in with Copics and then I cut everything out. I added the images over the background with dimensionals. I added some Clear Wink of Stella to the Bacon and egg images and then some Sparkling Clear Sequins from Pretty Pink Posh for a little extra sparkle. 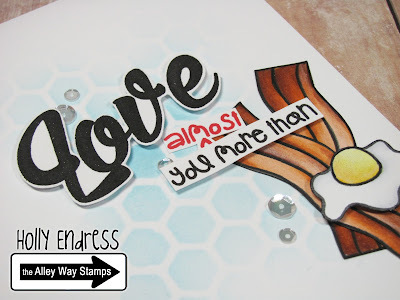 Be sure to head over to the Alley Way Stamps Blog for more inspiration. I'll be back later today with some more projects! !